Calvillo (Spanish (help·info)) is a city in the Mexican state of Aguascalientes. The town serves as the municipal seat of the surrounding municipality of Calvillo. Calvillo is the second most populated city in the state, surpassed in importance only by the capital city. It is located about 52 kilometers from the city of Aguascalientes. It stands at 21°51′N 102°43′W﻿ / ﻿21.850°N 102.717°W﻿ / 21.850; -102.717 in the southwestern corner of the state. Monument at the Plaza reads: "Heroes who gave us Country and Freedom". Calvillo has a number of attractions of interest to tourists. One of them is the Main Square, which dates from 1778 and is famous for its orange trees. Calvillo is also home to the Temple of Our Lord of the Salitre; built in 1772, its interior features paintings that are considered jewels of religious art. The attractive dome topping the church has an exceptional size and diameter. Its rarest feature is that it is made as a single architectural piece; there are only five domes of this style worldwide. The interior of the dome features exquisite frescoes depicting the life of St. Joseph, the patron saint of the city. The Guadalupe Temple is another important church featuring majestic towers. Another interesting place is the Malpaso Dam. The outskirts of Calvillo are a magnet for tourists. The Sierra del Laurel, south of the town, is a prolongation of Sierra Fría and highly sought-after by rock climbers because of its steep sides. Also nearby are the La Cordorniz Dam, and the ex-convent of the Tepozán, where, at the bottom of the gully, there is a rocky area with cave paintings. The prehistoric paintings of El Tepozan show diverse figures in different colors imprinted in various eras. Very close to these two attractions, in the town of La Panadera and chikis it is still practiced the old craft of embroidery and unthreading or "deshilados", the state's craft by excellence. Calvillo is the largest guava producer in Mexico and famous for its superb confectionery and liqueurs made from this fruit, which you can sample at the Guava Fair held during the first week of December. The economy in Calvillo is centered on the guava, although there is other agriculture and a great deal of commerce. Calvillo is better known as the world capital of the guava. 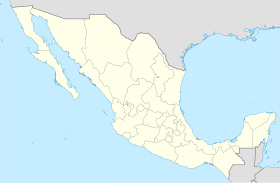 People from calvillo are called "calvillenses". ^ "Calvillo". Catálogo de Localidades. Secretaría de Desarrollo Social (SEDESOL). Retrieved 23 April 2014. ^ "Estado de Aguascalientes-Estacion: Calvillo". Normales Climatologicas 1951–2010 (in Spanish). Servicio Meteorologico Nacional. Archived from the original on 2015-05-18. Retrieved 8 May 2015. ^ "Extreme Temperatures and Precipitation for Calvillo 1959–2010" (in Spanish). Servicio Meteorológico Nacional. Archived from the original on 2015-05-18. Retrieved 8 May 2015.